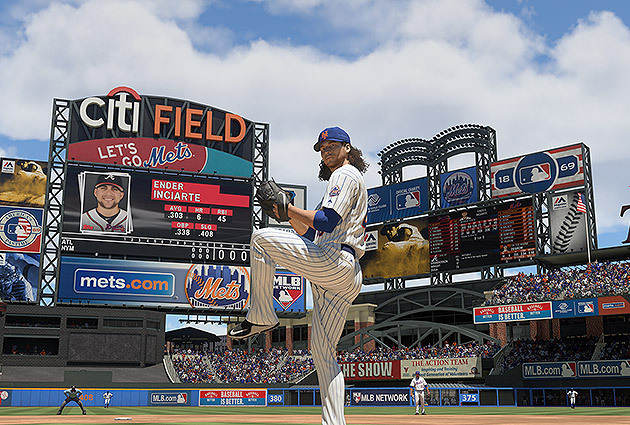 Review: While the new features of MLB The Show 16 don’t blow you away, it remains a must-have for baseball fans as they gear up for the season. Picture a day at the ballpark. The bright green grass covering the outfield, the puff of dirt after a head-first slide, the sun gleaming off an infielder’s sunglasses. After a long winter, there’s not a more inviting sight. MLB The Show 16 transports you there instantly. It’s a gorgeous game that perfectly captures the look and feel of baseball. From the shadows creeping across the infield to the look and feel of the dugouts, it’s all there. It isn’t limited to the surroundings either. Distinctive running styles, a wealth of new animations (hello, Jose Bautista bat flip!) and the return of “Sounds of the Show” (the ability to customize music for walkups, reliever entry and more) round out one of the most impressive game presentations around. If you’re looking for new features, you won’t find much in the gameplay—and that’s a good thing. Smooth, realistic baseball has been a trademark of the Show series, and it’s on full display in this year’s version. Whether you’re a rookie or a series veteran, you’ll have no trouble picking up the controls. The one major addition to the game is the ShowTime feature. Exclusive to Road To The Show mode, it allows players to slow down key moments in the game so they can catch up with that bottom-of-the-ninth fastball or ensure they haul in the game-winning catch. A game-changer this is not. But it’s a cool little wrinkle that adds some cinematic flair to a mode otherwise lacking in sizzle. Calling Road to the Show vanilla isn’t a knock (at least it's not meant to be). As anyone who has played NBA 2K16’s MyCareer mode knows, less is often more when it comes to these things. Fans of the mode will appreciate the subtle tweaks, foremost among them the ability to easily play out a string of games without returning to the menu. You’ll have a hard time putting the controller down once you get rolling here. Other modes are less successful. Conquest Mode marries baseball with … Risk, and it’s as out there as it sounds. Your task is to compete against 30 other MLB teams to see which team can build the largest fan base and “conquer” North America. The competitions themselves are short (three-inning bursts) and the concept is original, but this is innovation for innovation’s sake. Battle Royale is another new mode, similar to Draft Champions, which was introduced in Madden 16. For fans looking to build a fantasy roster, this will provide hours of entertainment. The backbone of any sports game these days, Franchise Mode is as robust as ever in The Show. You can play online or off and geek out with GM goals and a new player chemistry feature. Think building a championship roster is easy? Put yourself to the test here. Considering that it’s the only baseball game around, The Show could have rested on its laurels. But year after year it continues to innovate and expand. And while the new features don’t blow you away, the game remains a must-have for baseball fans as they gear up for the season.